The Foreign Employment Bureau (FEB) yesterday said that most of the Sri Lankan expatriate workers who were being held in jail in the Middle East had committed drug related offences. Monitoring MP, Ministry of Foreign Employment and Sports Hector Appuhamy revealed this at a press conference last afternoon. However the MP fell short of giving statistical details about his claim but pledged to come out with the details shortly. 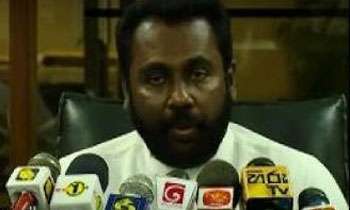 The MP who clarified recent reports that 49 Sri Lankan expatriate workers are stranded in Saudi Arabia while being held at a Women’s Welfare Centre (WWC) in that country, said legal issues pertaining to the workers is the cause of the delay in bringing them back to Sri Lanka. He said there are 49 Sri Lankan expatriates being held in the WWC in question. He said 14 of them were found to have committed offences. Accordingly nine of them have been arrested and were being held in custody while cases are pending against five. It was revealed that issues pertaining to 21 expatriates have been solved but they will have to remain in Saudi Arabia till they are given exit visas by their employers. Another 14, kept in the WWC, are those whose employers had refused to pay them wages. “We are currently in talks with the employers who have defaulted paying salaries but it will take some time to get them to settle as the laws in Saudi Arabia are strict,” he said.